At least 26 persons has benefited from Rotary Club of Ikate’s empowerment scheme which held on Tuesday, November 27, 2018. 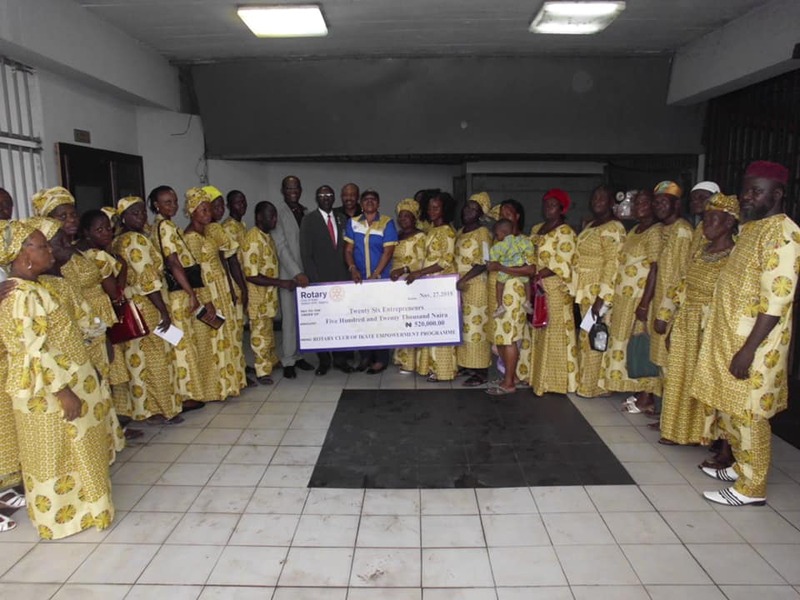 The beneficiaries smiled home with a cheque of N20, 000 each officially presented to them on behalf of the club by the District Governor, Rotary International District 9110- Rotarian Kola Sodipo who was on an official visit to the club on the said day. The club which is currently led by the Inspiration president, Rotarian Monique Nwokoro embarked on a mission to financially empower indigent members of its community but in order to make the empowerment even and be fair to all, the club decided to pick beneficiaries from different spheres of life which include church, mosque and market. Rotarian Nwokoro, while explaining what the scheme is all about, stated, “We decided to touch the lives of these selected number in our community. We met with the Iya Oloja (woman market leader) at Lawanson market, Catholic church a mosque. DG Sodipo spoke to the beneficiaries saying, “We all know that it is better to give than to receive. This is one of our areas of focus- Economic Empowerment. It is not the amount that matters but your ability to use the money for the purpose it is meant for because we have our own challenges too. “The club members have their own challenges too but they have decided to sacrifice this token for you all, their challenges notwithstanding. We hope that you all will set up your businesses successfully and use the profit to continually run your businesses”, he added. One of the beneficiaries, Mr Badejo thanked the club on behalf of all the beneficiaries. The DG also inducted four new members into the club. The club also presented N500, 000 cheque as university tuition fee to the Onyike Chinaza Nancy, the daughter of a late member of the club. The cheque was received by the beneficiary's uncle on behalf of the beneficiary who is in school. 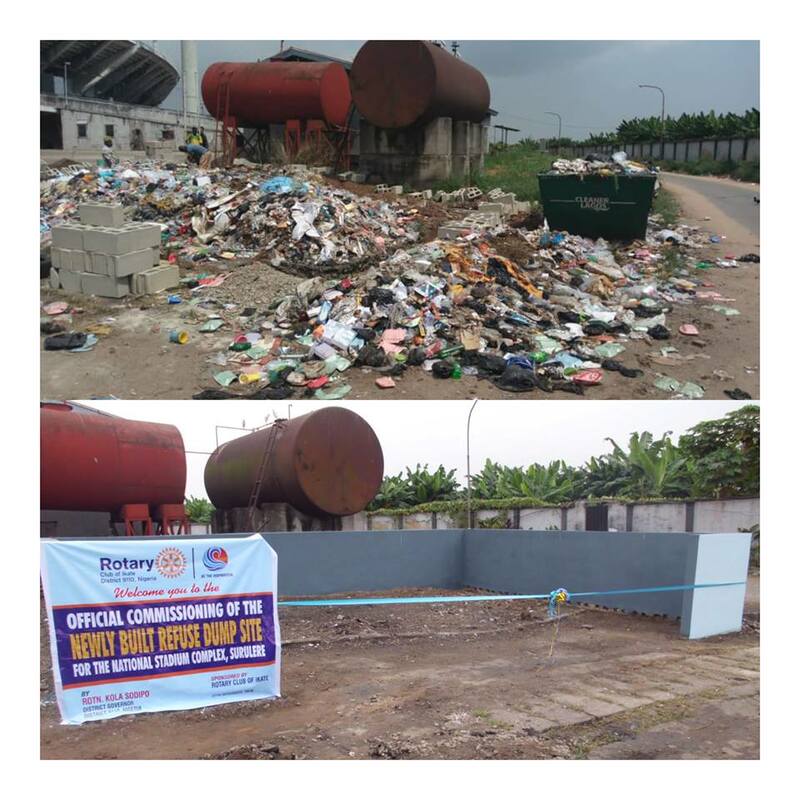 Earlier that day, the club members had led the DG who was accompanied on the visit by the District Secretary, Rotarian Kola Ojelabi and some other members of his entourage to the waste dump at National Stadium in Surulere, Lagos which was just beautified by the club. The dump was however officially commissioned by DG Sodipo. The commissioning was witnessed by Alhaji Bode Alli Durotoye, the Deputy Director Federal Ministry of Youths and Sports, Lagos Liaison Officer. Four new Rotarians were also inducted into the club by the DG.